A few weeks back, I recapped the book release and conversation event for Dr. Nadia Lopez’s newly published work, The Bridge to Brilliance, at BRIC Media House in Downtown Brooklyn. As I have completed the book, I wanted to share my experience in reading it, and the lessons that have rang true to me. 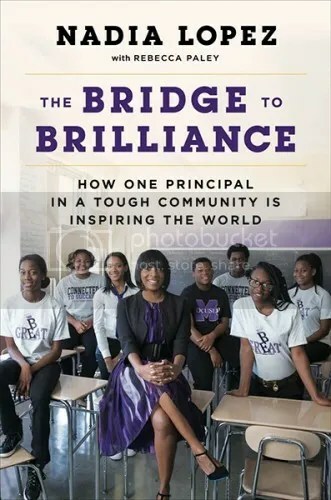 The Bridge To Brilliance is a non-fiction work by Dr. Nadia Lopez, principal of Mott Hall Bridges Academy middle school in Brownsville, Brooklyn. She quickly rose to fame on the internet in the past year when a student of hers named Vidal mentioned to Brandon Stanton of the popular Humans of New York blog, that she was the person that most influenced his life. The viral reaction of this post led to a full profile on the school, its staff and students, and a massive crowdfunding campaign to send the students on annual trips to Harvard, which was fully funded over 10 times over. The book recounts Lopez’s own childhood, growing up in Crown Heights, Brooklyn to immigrant parents (from Guatemala and Honduras, respectively), and how good teachers affected her life and livelihood in her younger years. It focuses on Lopez’s transition from the corporate world working at Verizon to the NYC Board of Education as a Teaching Fellow, to her current position as founder and principal at Mott Hall Bridges Academy. The tone of the book is very no-nonsense and easy to read as it is the words of an educator. Lopez clearly gives breakdowns on the NYC Board of Education and its processes in funding, mass gentrification and its effects on students, and the importance of taking students outside of their school and comfort zones to experience the vast world outside of Brooklyn, New York. As the daughter of immigrant parents from Belize who have worked for (and continue to work for) the NYC Board of Education in special education the majority of my life, I immediately connected with the majority of the stories in Lopez’s book. A lot of jargon, specifically in the special education sector, which Lopez worked in in her earlier years, was easy for me to understand as I have learned it from my parents. It felt like with each page I turned, I was reading the experience of someone just like me, which I do not often experience when reading books. The words are very familiar. What I did not entirely expect, was the amount of trials and tribulations that Lopez went through, both in her personal and professional life, to get to where she is today. She mentions that she was on the point of giving up when Brandon Stanton visited her school. It made me realize that everything is not as it seems, and that sometimes in life we have to reach rock bottom in order to go up. Her steadfastness and relentlessness did not allow her to give up on herself or her students when the future was not promised. I really enjoy this story because it really did inspire me to keep going, but to be kind to myself. Women, particularly Black women and other WOC are often expected to be strong, but it is necessary to have a tribe of women and men to lean on in the tough times to get through it all. If you are interested in learning more about the NYC public school system, or are a lover of inspirational stories (or both), I would definitely suggest picking up The Bridge To Brilliance. The book is available for purchase at booksellers nationwide, with all online retailers listed on Dr. Lopez’s official website. Happy reading!